This sales course is customized for the needs and challenges specific to professionals selling video surveillance and access control systems. Plenty of general sales training exists, but none focus on the specifics, nuances, and complexities of selling security systems. This IPVM course solves this. Through a series of 10 1-hour live webinar classes, including participants discussing with the instructors, plus quizzes and assignments, attendees will improve their sales skills and abilities to generate leads and close business. (1) Why Customers Don't Need You Anymore: Learn the reasons it is much harder to reach customers today, and a modern strategy for selling security systems you can implement immediately. This session sets the foundation for the course. (2) Getting Appointments Using Email - Learn how to write emails that increase responses and getting appointments. You'll get a worksheet and practice in developing and improving your own emails and communication. (3) Social Selling and Networking for the Security Sales Professional - Today, knowing the most people does not always win anymore. In this new world, learn a specific process of social selling and traditional networking that works. (4) Delivering Excellent Sales Presentations - Learn how to gain full engagement from your customers and prospects by understanding why most audiences are distracted and how to execute proven methods to hold their attention. (5) Ten Ideas to Beat Low-Cost Providers - One of the top problems for sales professionals, we provide ten ideas that you can implement immediately, and help you position against these competitors now and in the long run. (6) How to Present Your Value Proposition - Many sales professionals unknowingly use vague, unclear or undifferentiated value propositions. We teach you simple, yet important steps to most effectively presenting your value proposition. (7) Ten Things NOT to Do When Competing Against Low-Cost Providers - Many fall into traps when selling against lower-cost providers. We teach you what these are, how to avoid them, and alternative approaches. (8) Proactive Account Management - Win more business from your current accounts. Elevate yourself from delivering good service to making your customers successful and relying on you to guide them into the future so you will ultimately win all of their business. (9) Build Relationships with A&E Firms and Consultants - Specifiers are important but many salespeople struggle to build relationships with them. You will learn the dos and dont's to better interact and influence them. (10) How to Sell Service Agreements - Learn a process of selling them to various organizations. Increase your sales services agreements, making you stickier and more successful with your customers. This course is designed for security sales managers (reps, RSM, account executives, BD, etc.) and should help anyone who is actively involved in selling commercial / industrial / government security systems. This course does not cover residential or intrusion, as many of the techniques and challenges in that area are different. This is not a technology course and this is not meant for engineers / techs. If you are a tech who wants to get into sales, this would be a great course but if you want technology training, consider IPVM's other courses, such as the Summer 2018 IP Networking Course, the Fall 2018 Access Control Course or the Fall 2018 Camera Course. 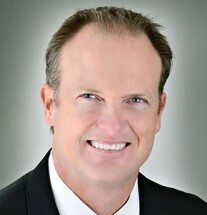 The course will be lead by Chris Peterson from Vector Firm with IPVM staff moderating. Chris is a leading security sales expert, leveraging significant field security sales experience, both as a rep and in management. Chris will lead each session with IPVM moderating questions and providing feedback on related IPVM research and testing. 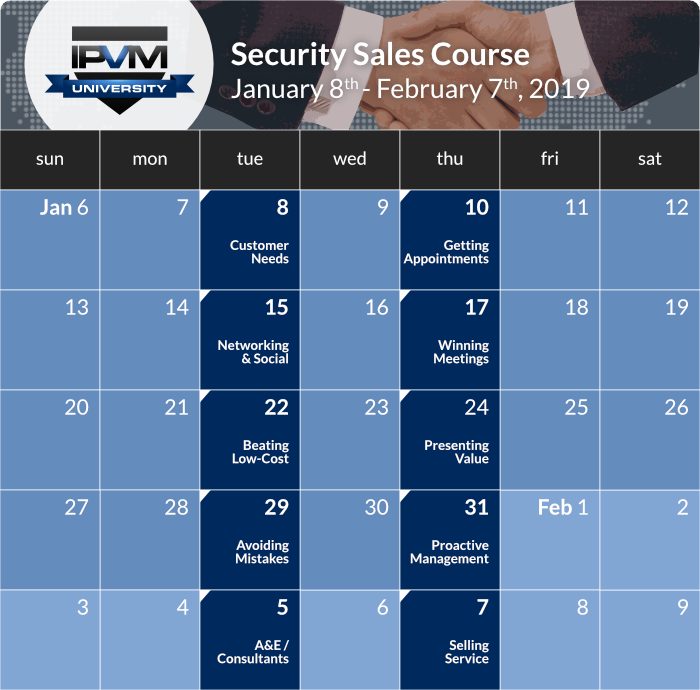 The Security Sales course will meet live online, starting January 8th for 10 times over 5 weeks (Tuesday and Thursday for 1 hour from 4pm - 5pm ET 20:00 to 21:00 UTC). Throughout the course, attendees will be able to submit answers to assignments with feedback from the instructors and fellow attendees. The goal of the course is that each attendee will be to identify and use at least 10 techniques taught in this course to improve their 2018 sales performance. No certification will be offered, as unlike technology courses, the goal is not a piece of paper but improved sales performance.